The work of Mr. Woodard is abundantly evident in the Town of Sandy Creek and Boylston Farm Book. Our goal was to document as many farms as possible and do it an interesting format. exter L. Woodard died at age 91 on October 4, 1971 at his family home, Wolf Creek Valley Farm, closing out a life time which had spanned the years from the era of hand labor and foot-travel to the age of nuclear power and moon-walks. At ninety-one, Mr. Woodard was the oldest resident of “The Valley,” that segment of the White and Sage School Districts in the western part of Sandy Creek Township where he had spent his whole life. He had lived over eighty-three years in the home where he died, having moved there with his father’s family when a child from the ‘Stephen Hadley’ property north of the Little Sandy and the Ackerman Hills where he had been born July 9, 1880. Dexter was the second of the three children of Simon Hadley Woodard and Lydia (Canough) Woodard. Dexter Levi Woodard was a direct descendent of Simon Hadley, who with Clark Wilder, had made a clearing in 1806 on today’s Lake Road. Simon Woodard’s paternal grandparents, Charles and Chloe (Lashure) Woodard were also west Sandy Creek pioneers having moved to the vicinity of the Norton Road in 1822 from Hoosick. Dexter sisters were Estella who married Marshall P. Wilder and Eudora who became the wife of Fred Lillis. Mr. Woodard married Mary Doneburg, daughter of John and Sarah Doneburg on October 16, 1906. Mrs. Woodard had attended the Pulaski training class and had taught in Illion and in the Sage and White District Schools before her marriage. She died November 9, 1948. Their daughter is Mrs. Maitland (Myrtle) Cummins. A member of Sandy Creek Grange for 43 years, Mr. Woodard attended the Center Methodist Church until its closing in the 1930’s. 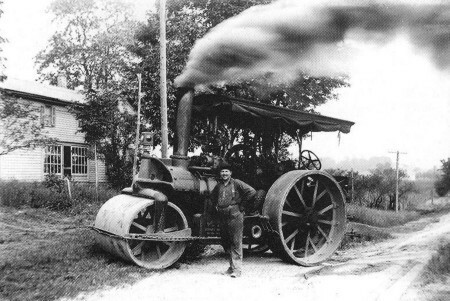 Raised in the Yankee tradition of tillers of the soil, “Deck” was a lifelong farmer but was blessed with an inquiring mind and a native mechanical ability. As a young man he was keenly interested in photography, preserving the Valley doings and landmarks on still existent glass plate negatives. With a neighbor, Ralph Trumbull, Mr. Woodard built the first telephone line from the Village to West Sandy Creek and about 1923 constructed the first battery-powered radio receiver in the area. Besides his daughter, Mrs. Cummins, Mr. Woodard’s survivors included his two grandchildren, Mrs. Robert (Marie) Wood and George Cummins, owner and operator of Wolf Creek Valley farm. Mr. Woodard’s other descendants include great grandchildren Roberta and John Wood and Kevin and Kelly Cummins, all of the “Valley.” Among his nieces and nephews are local residents Radcliffe Wilder and Miss Dorothy Lillis. Mr. Woodard is buried in the family lot in Woodlawn Cemetery, Sandy Creek. Copyright © History Center | Town of Sandy Creek, NY - All rights reserved.